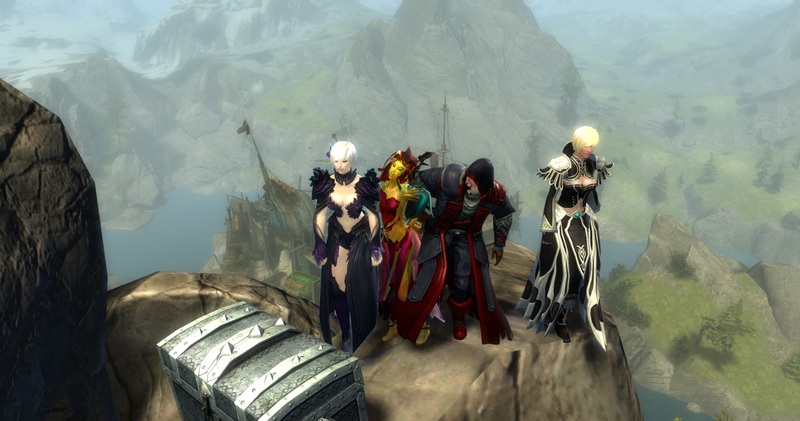 A Year of Guild Wars 2! 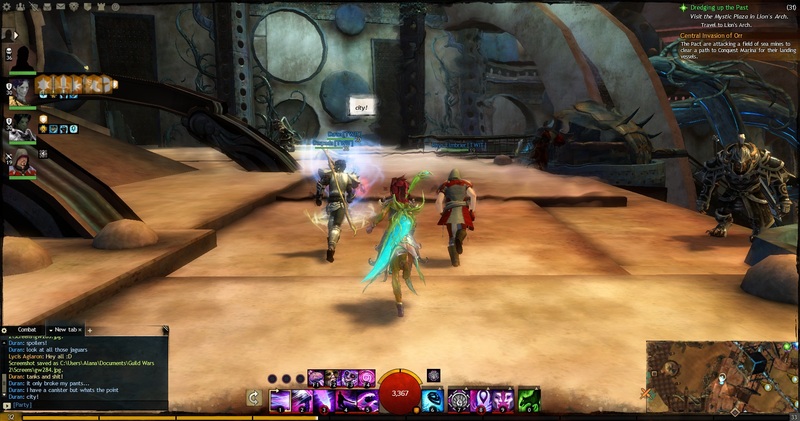 So, Guild Wars 2 just turned a year old, and as that landmark passes, it’s neat to reflect on the game, how it’s changed, and how it’s changed me as I play it. I started as, frankly, a very casual player of MMOs. My interests lie more in the direction of action/adventure than… well… bothering with other people. I’d dabbled in WoW and TOR with friends, but there were a great many issues with the very core of the gameplay that kept the genre from really grabbing me. However, the very little bit (only a few days really) of Guild Wars that I had played felt different, different enough for me to take interest in the prospect of Guild Wars 2. As the game loomed closer, I planned out my characters. 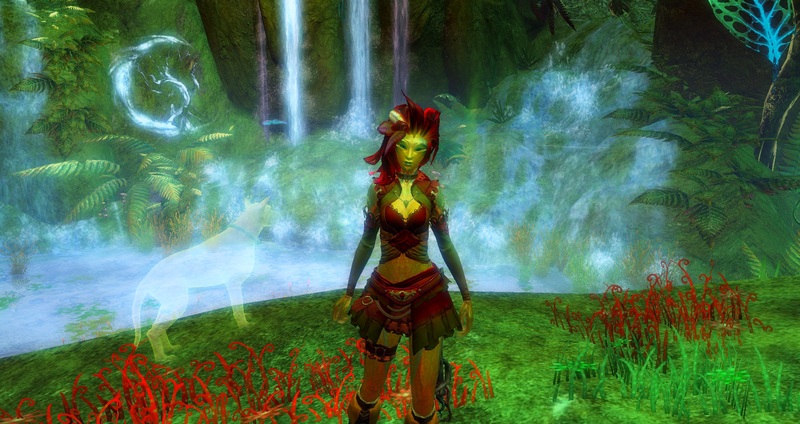 My main would be an Elementalist asura named Zott who primarily used lightning, and I would try a norn Ranger. A charr Warrior and a sylvari Necromancer would follow. I decided to add a human, in the interest of rounding out the races, and figured this throwaway character without a planned name would be a Thief. Headstart opened, I furiously created all my characters to secure their names, and that unassuming Thief got an old standby, Rhys, and a spur-of-the-moment surname, Elmbrier. He’d be something to turn to when I wanted a break from the ones I actually cared about. Just to play around and relax. Long story short, 12 months later Rhys is my only level 80, and that first asura, norn, and sylvari are no more. It’s been a long road, Rhys. My girlfriend told me to join her guild, which I was fine with being a part of as long as I didn’t have to interact with the other guild members. I’m not very social, and with my prior MMO experiences I had no intention of dealing with a bunch of jerkish, game-obsessed twits. Yeah, that changed too. She coaxed me onto Vent with them, and after my initial shyness, I consider my guildmates some of my best friends. Meeting up with a bunch of them at PAX East this year was an amazing experience, and it sounds really sappy when I say it like this, but Guild Wars 2 did in fact change my life. For the game itself, I wasn’t sure what to expect at the outset, but previous experience suggested a massive world with things of interest stretched out a great distance from each other. GW2 quickly showed me I was wrong on that count: It was in fact a massive world with things of interest so densely packed that it’s a wonder the zones weren’t bursting at the seams. Every crossroad, every hill, every half-hidden cave entrance promised – and delivered – something new, interesting, and rewarding to find. I fell in love with exploring Tyria, and even with my dedication to discovery, I only achieved map completion a couple weeks ago. Of course, map completion was part of the greatest lunacy I’ve committed in this game: The forging of a Legendary weapon. Me, a casual player who despised grind, slowly but surely working toward creating an item that takes hours and hours of dedicated effort and so many hundreds of bits of defeated animals. I’ve got a long way to go – apparently I’m about 27% done – but I will have my Quip eventually. As someone who didn’t know what to expect a year ago, and was blown away by what I found, I can only say that I’m eagerly looking forward to what will come from the second year of Guild Wars 2. So, I’m not going to lie, this post idea was blatantly “borrowed” from Lis, who recently made a very similar post. But really, it’s kind of a neat idea – seeing just how much you’ve done and how much time has been spent on various characters throughout the game. I spent some time going through all of my characters and doing a bit of number crunching this morning, and here are my results. Yup. I have one of each profession. I hadn’t originally set out to do this (I wasn’t too into necromancer at first, having disliked the profession in GW1, and I had utterly no interest in engineer at all), but it wound up happening after all. Surprisingly, necro has become one of the professions I like the best. Liusaidh, sylvari mesmer. Played for 781 hours and 22 minutes, 12 months old, 45% of my playtime. Will soon be the wielder of Bifrost. Rosheen, sylvari guardian. Played for 203 hours and 45 minutes, 12 months old, 12% of my playtime. Janan Savitri, human thief. Played for 119 hours and 42 minutes, 12 months old, 7% of my playtime. Ragna Blazefur, charr elementalist. Played for 64 hours and 9 minutes, 12 months old, 4% of my playtime. Brynja Rabbitfoot, norn ranger. Played for 191 hours and 55 minutes, 12 months old. 11% of my playtime. Wielder of Kudzu. Carella, human necromancer. Played for 141 hours and 27 minutes, 11 months old. 8% of my playtime. Glynha, sylvari warrior. Played for 77 hours and 35 minutes, 5 months old. 4% of my playtime. Searlaith, sylvari engineer. Played for 71 hours and 36 minutes, 9 months old. 4% of my playtime. Number of sub 80 characters: 6. I like making characters, what can I say. A few of these have been deleted and remade a few times – Katta started out as a warrior and one of my original characters made during headstart, but I couldn’t stand playing an asura warrior. Alianah was originally a ranger, but I wanted to remake her to look different and decided that hey, new necro! Deirvhile exists solely for crafting purposes. And Astrid got to use a scroll of experience which is why her playtime does not match her levels at all. Deirvhile, sylvari thief. Level 20. Played for 9 hours and 35 minutes, 9 months old. .5% of my playtime. Haneul Nae, human mesmer. Level 22. Played for 19 hours and 25 minutes, 6 months old. 1% of my playtime. Alianah, sylvari necromancer. Level 10. Played for 6 hours and 37 minutes, 3 months old. .4% of my playtime. Suvi Liina, norn mesmer. Level 5. Played for 3 hours and 19 minutes, 3 months old. .2% of my playtime. Katta, asura elementalist. Level 19. Played for 12 hours and 9 minutes, 3 months old. .7% of my playtime. Astrid Cheval, human guardian. Level 26. Played for 6 hours and 43 minutes, 2 months old. .4% of my playtime. Total time played: 1736 hours over the past 12 months. That averages out to about 144.67 hours per month, or 33.4 hours per week, or about 4.73 hours per day. Which…well, I’ve definitely had my marathon days where I had nothing else to do so I spent all of my time in-game. I’ve also had my ups and downs though, and in particular had a patch recently where I’d log in long enough to do my dailies, or not log in at all. What can I say, life can be busy. Number of legendaries created: 1. I made Kudzu back in March, and have written all about it previously. I am currently working on Bifrost and have reached a point where I just need to save up massive amounts of money or hope I get lucky; all that is remaining is some t6 mats, the icy runestones, and of course the precursor. I’m just really hoping that precursor crafting comes in sooner rather than later, especially as the mystic forge is proving to not be my friend here. If I actually get some time to play in the next couple of days, I should be getting that 8000 point chest very soon. I’ve been working on finishing up the Explorer category recently, finding the little mini-dungeons and such scattered around. I’ve also got almost all of the jump puzzles completed…but the ones I haven’t done I think will likely stay that way. Jump puzzles aren’t my thing. Many of those are from the Hall of Monuments, which I have 45 points in, making me a Legend of the Mists. The title I wear the most is Dungeon Master. At least one character is currently a Respected Achiever. I do not have all of the Living Story titles, as they either required a level of grind I was not interested in (Super Adventure Box), or luck that I do not have (Sanctum Sprint). 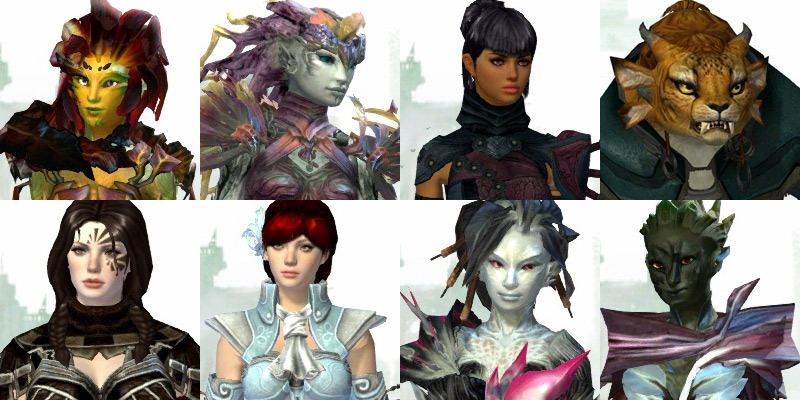 Number of characters descended from Guild Wars 1 characters: Three. Janan Savitri is the descendent of Farai Savitri, my dervish (who was also my main in GW1). Haneul Nae is the descendent of Iseul Nae, my ritualist. 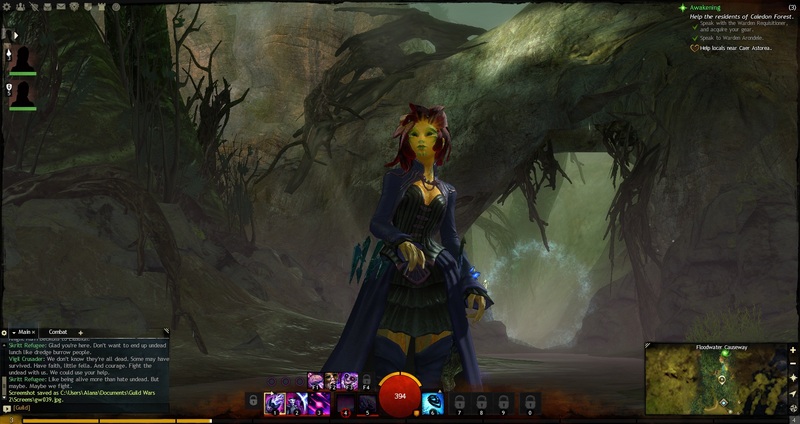 Astrid Cheval is the descendent of Lucia Cheval, my mesmer (well, one of them). And Liusaidh is…unintentionally named after Lucia (Liusaidh being the Scottish form of Lucia). Both are mesmers. Both are redheads. None of that was planned out…but while Liusaidh and Lucia are obviously not related to each other in any way…there’s some similarities there. Favorite race: GEE I WONDER. Favorite profession: …again. I wonder what that could be. Amount of money spent on armor: Holy crap I don’t even want to think about it. I’ve bought two full sets of t3 armor (sylvari light and sylvari medium), another set worth of various pieces of t3 scattered around three characters (includes human medium and sylvari heavy), and more sets of t1 and t2 armor than I could keep track of. Amount of fun I’ve had: …can you really measure that? 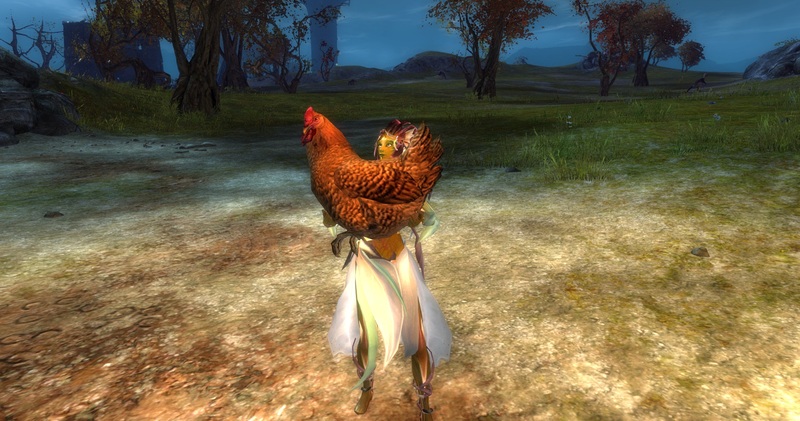 And to finish off, because it cracks me up every time I look at it, have a screenshot of a sylvari with a giant chicken. I remember how, at this time last year, the excitement for launch was through the roof. Headstart was only a couple of days away, with the official launch only a couple more after that. The night of headstart, I remember sitting on ventrilo with several other members of my guild, everyone hammering on the “log in” button for the game client, since it had been teased that the game would possibly go live a few hours early. The flurry of excitement and cheering when we finally got in. And then the dead silence as everyone hurriedly made their characters and locked in their names. Those are fond memories, and that initial rush of “OHMYGODTHEGAMEISLIVE” is something that we’ll never see again. Liusaidh, my main, having just been created. Of course, there were issues that night (and the first few days of release). The lag was so bad that I crashed multiple times just trying to get my baby mesmer (my main) through the sylvari starting instance. Guilds wound up breaking so that leaders would show that they weren’t in a guild, and could not receive invites. It took weeks for the trading post to finally be up and running full-time. Parties broke frequently and trying to get everyone in the same overflow (yes, this was when all of the starter zones always had overflows and you could cheat the lack of guesting with this) could be dicey. But no game launches perfectly, and all things considered…the problems were ironed out quickly. The very first night of headstart, a few of us decided to take a trip to Orr. We were all low-level – as in, under level 5. But hey, why not! It was a completely ridiculous and, to be fully honest, rather terrifying thing to do. Things could one-shot us with a glance. I know that those of us that did it amused everyone else on vent with our panicking at enemies seeing us. We didn’t quite make it – I got lost somewhere in Sparkfly Fen and was eaten by the champion risen megalodon. But it was a lot of fun. Liusaidh, level 3, in Sparkfly Fen. We tried it again a bit later, when we were all a bit higher in level. We made it all the way to Lone Post Waypoint in Straits of Devastation before we simply could not get any further. We were slightly disappointed at this fact…as we did not realize at the time that Straits was part of Orr. Now, because of this, low-level Orr runs has become something of a guild tradition. I have a lot of screenshots from that excursion, but this is one of my favorites. Running like hell with broken armor sums up things well. Within those first few weeks, we did a lot. Leveling our characters. Exploring zones. Testing out different things (one of my favorites was meeting up with Opt in a zone and him asking me to stand at the bottom of a cliff so he could see if Death Shroud would let him survive the fall. It didn’t). Starting the story mode dungeons. Doing jump puzzles. Dabbling in crafting. Dancing anywhere and everywhere. After completing Griffonrook Run…THIS WILL ALWAYS BE ONE OF MY FAVORITE SCREENSHOTS. You’ll notice that in most of these screenshots, I’m with other people. This game has done something that no game has ever done before – make me actually enjoy and want to play with others. I’m not a social person by any means. I am a very quiet, shy, reserved introvert most of the time. But through a combination of chance and luck, I’ve made an amazing group of friends because of this game. My guild is amazing, and several of the members – my co-leaders and several of the officers – have become such good friends that not having them in my life is a bleak thought, and I am so very grateful that I have met them. Time went on in the game. 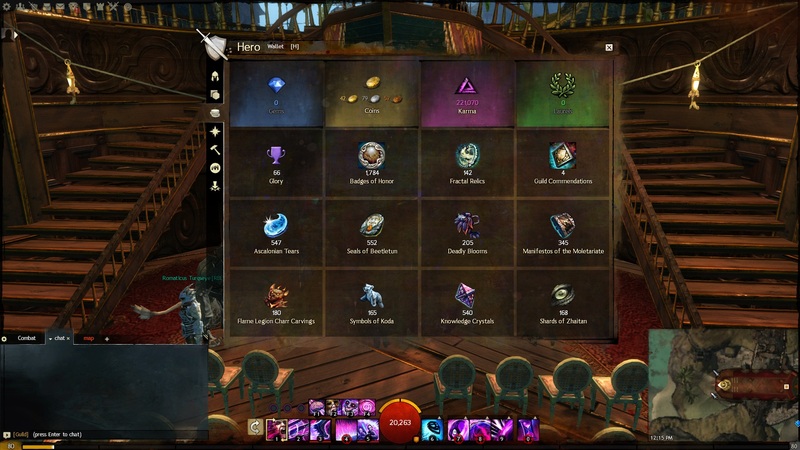 New content was added – Halloween, the Lost Shores (good in theory, fell short in execution), Wintersday, and then we reached 2013. With the new patch in January, Flame and Frost, we began to see a new story take shape, and to see what ArenaNet was planning on doing. The Living Story has gradually picked up speed over the months, now going to a biweekly update, and the quality has only increased as time has gone on. Guesting was finally added, though imperfectly – it is limited to servers on the same data center, which means no NA-EU guesting. I keep up hope that one day that will be added in. Fractals were added, similar to dungeons, and with it came Ascended gear. Guild missions became a thing. Several updates have been made to dungeons themselves. A good number of quality of life changes have gone in (first dungeon tokens becoming account bound rather than character bound, and then the removal of physical tokens in favor of the account wallet, rotations for dailies, rewarding of karma for dailies, guaranteed rewards for meta events, champion kills, and dungeons), each making things just a bit better. In the past year, I’ve leveled up 8 characters to 80 – one of each profession. I’ve crafted the legendary longbow Kudzu for my ranger. I am currently in the process of crafting the staff, Bifrost, for my mesmer. I’ve completed Master Crafter and Dungeon Master. I’ve spent far too much money on armor (I have two full sets of T3 cultural, and a third worth of pieces scattered across various characters). I enjoy theory-crafting various builds and then seeing how well they work in practice (my favorite was being told my engineer build was “just so crazy it might work”…it works quite well!). 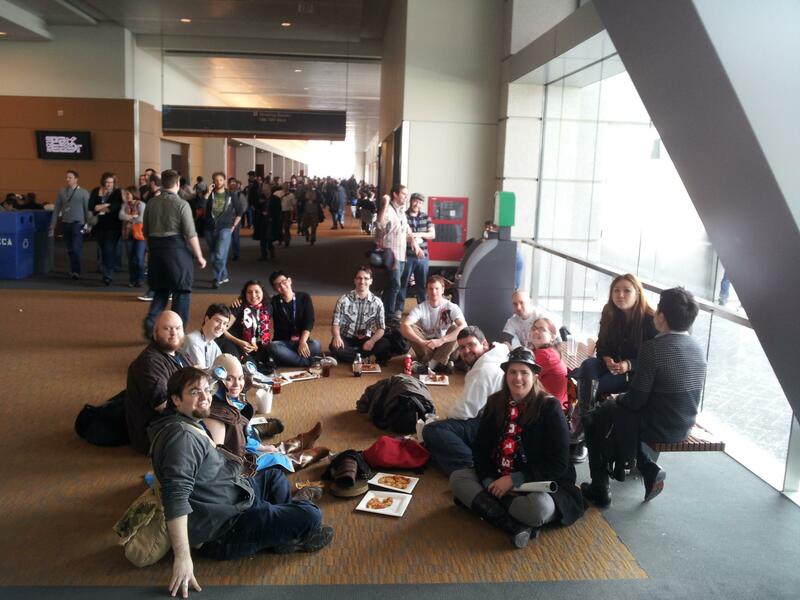 Back in March I was able to attend PAX East, which was an amazing time for so many reasons. It was the first out of state convention I was able to attend. It was a nice vacation. Several members of [TWIT] also went and we all got to meet up and spend the weekend hanging out in person. And we also managed to spend time with two ANet devs, Jonathon Sharp and Jon Peters. Needless to say, this past year has been great, both in-game and out of it, and I can only look forward to what the next year(s) will bring! The biweekly update schedule for Guild Wars 2 continues, with the newest patch, the Queen’s Jubilee, having gone live this week. And, well, remember how a few weeks ago I had said that the Bazaar of the Four Winds had been the best patch yet? Well. The Jubilee has replaced that, I think. I’m really enjoying this patch so far, and there’s a good number of reasons why. The first is the quality of life changes that were added, the biggest of those being the account wallet. Now, I run dungeons a lot. I just got my 7500 achievement point chest last night. I do fractals on occasion. And I have a lot of alts. What this meant before was that I had far too much bank space being taken up by tokens, badges, and relics. Shifting money from character to character for big purchases was time-consuming and annoying. I had karma on low-level alts that was basically useless for them. Now, none of that is a problem any longer. If you have a glut of badges of honor, by the way, you can use them to outfit characters with exotics for not a huge amount of money. All of your gold, karma, laurels, badges, glory, tokens, and relics will now will be contained in this wallet, that can be accessed from either the bottom of your inventory window or the hero panel. Yeah, you have to log into each character for their loot to be deposited (items in your bank are added automatically), but the result is that you never have to scramble around for gold or worry about bank tabs being taken up by tokens or anything of the like. And as the items are no longer physical items, there’s no stack limits to worry about. My one quibble is that there is no longer any way to deposit money in the bank, which means that it’s harder to set aside money and just not spend it, since you always have all of your cash on hand at all times. But ultimately, it’s a minor quibble. The wallet is otherwise amazing and I’m glad it’s there. So I haven’t even really gotten into the meat of the patch yet. Queen Jennah is celebrating 10 years on the throne of Kryta, and everyone is invited to the party! But this is no usual party, and most of the celebration consists of killing lots and lots of things. It kicks off with a story instance in Divinity’s Reach…which, personally, I loved. A number of familiar characters have returned (Rox! <3), there’s a good amount of sass from the NPCs, and it’s just plain fun to participate in. 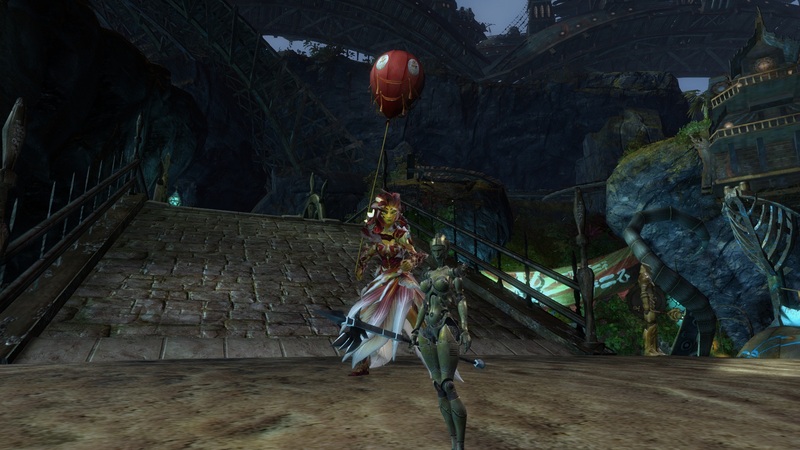 All across Tyria are balloons that can bring you to Divinity’s Reach for free. Each balloon has a chest, and there’s events going on associated with each – whether it’s defeating a champion of Jennah’s, escorting an emissary, or fighting off an Aetherblade attack. These events happen very frequently, which I really enjoy. Once in Divinity’s Reach, there are a few new events to participate in. One is the Crown Pavilion, and another is the Queen’s Gauntlet. The Gauntlet is a series of opponents you fight against, but I haven’t actually tried it yet, so I can’t say much about it. The Pavilion is essentially one huge arena split into six areas, each having a different common enemy type. Here, you can fight and kill veterans to your heart’s content (seriously – nearly everything in here is a vet), as well as participate in events where you have to defeat an enemy of Legendary difficulty. It’s great if you want something to do with a group, and it really highlights another change that was brought in with this patch. Yes, the champion loot. Champs used to guarantee nothing, then an item of blue or better quality. Now, when you kill a champion (or legendary) enemy, you get a loot bag – different enemy types carry different bags. These bags contain karma, money, and other various items – ranging from skill points, crafting materials, and gear – including new weapons with unique skins. Tied to that is another new change that I especially love. 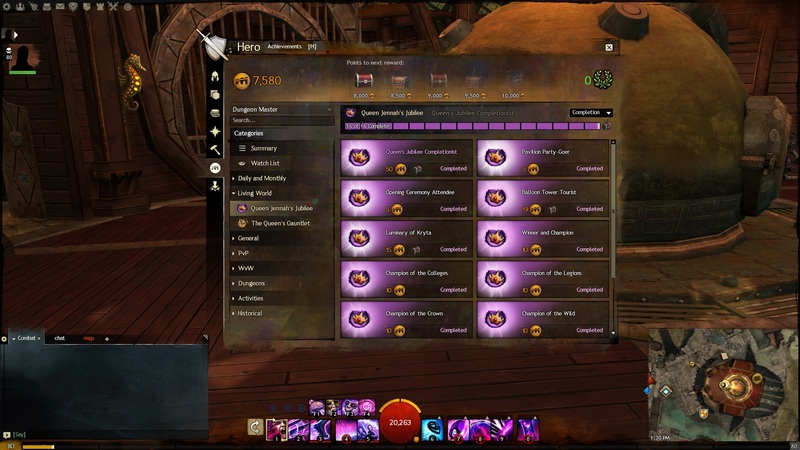 When you run dungeons, the normal money reward you used to get for killing bosses has been removed, and replaced with the champion loot bags. On top of that, you now get a straight gold reward at the end of the dungeon, ranging from 1 to 3 gold. Now, I love dungeons. I definitely prefer them to fractals. But previously the rewards from them simply were not worth it most of the time. Now, you know that you’re always going to get a set amount of money, on top of tokens, on top of champ bags, on top of all of the other loot you get. Suddenly they are far more rewarding. I have never finished a meta-achievement this fast. And I still want more. As a side note, I feel like drop rates in general have been tweaked a bit; maybe it’s the fact that we’re simply fighting more things right now, but it feels like enemies are dropping more loot. I feel like the new content added to this patch are things that will keep people occupied with that content for the entirety of the patch. 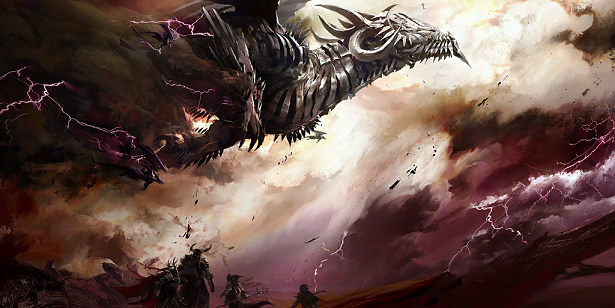 Ravious wrote a bit about it earlier today, saying how it goes back to the core of what Guild Wars 2 play is about – events in the world – and I agree. There are meta-achievements, of course, but the basis of essentially everything you do for it is events, and the events are frequent. It succeeds in spreading people into zones they normally wouldn’t go to, for the balloon events, and with the rewards being as good as they are, keeps people playing. Also, I must say, the way of handling the meta-achievement this time is pure genius. Dailies now contain one Jubilee achievement, and these count towards the meta-achievement. You, in fact, need to complete at least three of these to finish the meta; and if you don’t have a ton of time, just by doing dailies you’ll be able to complete it without any problems. Brilliant idea, and I hope it’s one that they stick with. The past few patches have definitely increased in quality with each one, and it’s a trend I’m hopeful will continue. The next patch we’ll find out about next week on Tuesday…and do note that the game’s birthday is coming up at the end of the month, in just a few short weeks. I wonder if we’ll finally find out what they intend to do for their anniversary?